Its a GROOVE THING, GROOVE THING.. YEAH YEAH !! 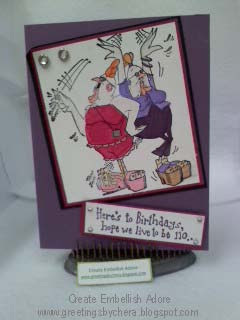 Sentiment : Here's to Birthdays, Hope we live to be 110... (inside reads) ... pounds. Happy Birthday! We can all related to such actions with your closest friends, especially when celebrating birthdays. They just make me smile when I look at them! Makes me want to get up and shake my tail feathers! Ooooooooooo Snap! I love these stamps...what co. are they by? Where did you get them? I'm a red hatter and this would make a cute card.